At the village school of Kadzinuni in Kenya nearly 1,000 children aged 7 to 16 attend each day. They have desks to sit at and they have text books for the curriculum, all provided by The Friends of Kadzinuni. They work hard and now their school is one of the best on the Kenya Coast. Yes, this is a story of success! On our recent visit in October one young boy called Masood approached us and asked "Please can you get me a school bag to keep my books, pens and pencils safe and clean?" We looked around. Hardly any of the children had anything more than a flimsy plastic shopping bag, most had no bag at all. 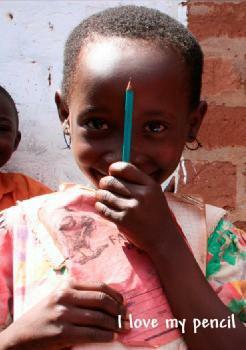 For just £3 we can provide a lightweight bag complete with some pens and pencils, but we can actually do much more. Ever since we have been supporting Kadzinuni one of the biggest impacts of our work has been the increase in the community of having a feeling of self worth, created by them knowing that people in the UK know and care about Kadzinuni. They now believe that their village is an important place. This is the sense of community that exists all over the developed world; at Kadzinuni it is actually causing the kind of deep seated change that will see Kadzinuni people improve their own lives and become a self sufficient wealth generating community. We need to order a minimum of 100 bags for an individual organisation (School, church, Community Group etc.) to be able to make this work. We have to provide 1,000 bags! You can order yours by using the form available on the right, or better still use the justgiving online link. So, how do school bags help us build on this? It’s really quite easy. The bags we want to provide will be special. Firstly they will carry the Kadzinuni School name, secondly they will carry the name and logo of the school or organisation who provided the bag and thirdly they will contain a photo and/or message of support from the person who paid for the bag. These bags will be used but will also be treasured as precious evidence of the fact that Kadzinuni children are important to people in the UK! A simple yet powerful message.